OMAHA, Neb. — Florida (51-17) overcame a 3-0 deficit en route to an 8-4 victory over Texas (49-18) in front of 25,521 fans on Saturday night at TD Ameritrade Park Omaha to complete the first day of the 65th NCAA College World Series. With their first-ever victory over the Longhorns, the Gators will next face Vanderbilt (53-10) for the fifth time this season in a winner’s bracket game. Tonight’s triumph also matched UF’s single-season mark for wins set in 1991 (51-21). Sophomore right-hander Hudson Randall improved to 11-3 on the campaign by limiting Texas to one earned run over 6.2 innings, junior Greg Larson struck out the only batter he faced with the Gators holding a 5-4 lead in the seventh inning and the tying run aboard at second base and junior Nick Maronde set down all six batters he faced and totaled three K over two innings to collect his third save. Offensively for the Orange and Blue, senior Bryson Smith (2-for-2, two runs, two RBI) reached base in all five of his plate appearances, with two singles, two walks and a hit-by-pitch, sophomore Cody Dent put the Gators ahead to stay with a two-out RBI double in the fourth inning off junior Taylor Jungmann (13-3), junior Daniel Pigott was 2-for-3 and sophomore Brian Johnson returned to the lineup for the first time since May 28 and delivered a key two-run double that should have been ruled a homer in the seventh inning. In 6.2 innings of work, Randall scattered five hits, gave up four runs (one earned) and registered five strikeouts without permitting any walks. 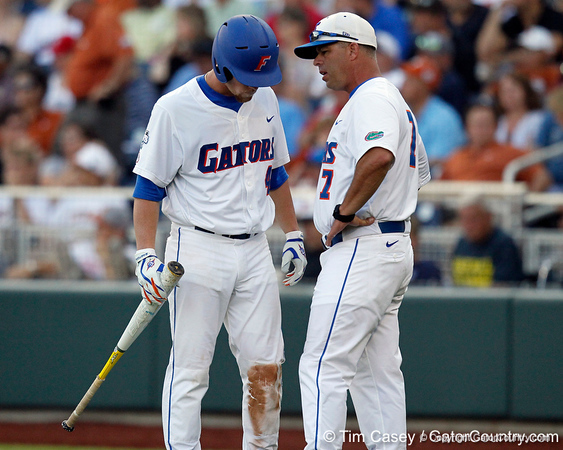 Florida held an 8-5 advantage in hits and notched its 19th come-from-behind win of the season.